Sherd of the Geometric period, Sifnos, 8th century BCE. More than two thousand years ago, the Mayans of eastern Guatemala used ceramic teapots to pour themselves hot cocoa (or some chocolate drink, at any rate). In ancient Greece and Rome, communities stored grain in earthenware pots, safeguarding their bushels from rodents and rot. Reaching even further back, to the late Pleistocene of twenty thousand years ago, Paleolithic foragers near the Yangtze River used ceramic vessels as tools for cooking—a sophisticated strategy for eking out more calories. In contemporary archaeology, pottery is a key tool for parsing out the details of prehistoric life. 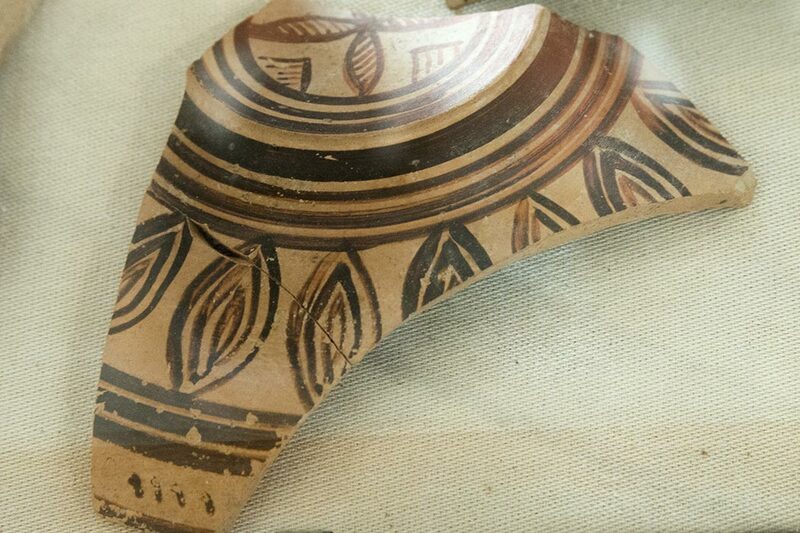 Recovered pottery sherds, or fragments, can lead us to conclusions about labor in ancient societies, what resources those societies had available, and what foods people opted to put in their pots. Having a working theory of containment. Pottery-making is a series of tradeoffs that requires the ability to successfully negotiate these three technologies. And as with any type of tool technology, ceramic-making shows choices made over and over. Choices about clay: Is it from close by? Farther away? How will it hold up over time? Choices about firing temperature: High? Low? What do different temperatures do for different types of clay and different vessel shapes? Choices about what the ceramic will do: Does it need to be watertight? Does it need to be rodentproof? Combine these three technologies with the artistic choices that go into decorating pottery, and it’s easy to see why tools made using these techniques, once mastered, became the most ubiquitous artifacts in the course of human history. The first ingredient of a ceramic pot or other tool is clay. Clay is malleable and almost plastic-like when wet, but rigid when dry. Prehistoric makers of ceramics combined the raw clay materials with a temper—any material that prevents shrinkage when clay is heated up—allowing them to moderate the look, feel, and structural properties of clay. Temper is an integral additive to get the clay to behave in certain ways. The type of temper used in pottery depends on both the materials available to the ceramic makers as well as the desired effect of the additive. Examples of temper include fibers, sands, and shells. Each type of temper combined with each type of clay creates a soil with unique properties; manipulating these soil properties is what underlies clay technology. 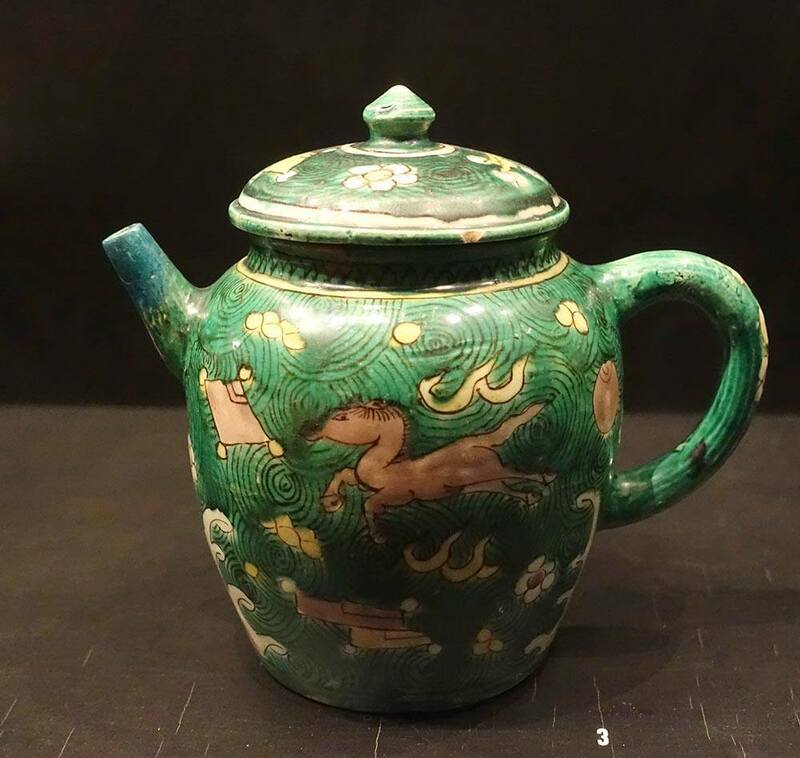 Ming dynasty porcelain teapot with colored enamel—Östasiatiska museet, Stockholm (via WikiMedia Commons). Once clay has been molded, shaped, brushed, or coiled into the maker’s desired shape, a ceramic can either be left to harden as the moisture slowly escapes from the clay; or the ceramic can be fired, making it more robust or durable. Archaeological evidence suggests that the oldest kilns used for firing pottery are approximately 26,000 years old. Since the late nineteenth century, archaeologists have recognized that the physical changes between fired and unfired clay represent a huge leap in the variability of human tool use. Unfired pottery can store grains and water (or even function as an object of prestige), but the transition to firing indicates a willingness to grapple with one tool—fire—as a technology for creating other tools. If clay plus fire equals the beginning of ceramics, the final figure in the equation is applying a theory of storage to those two variables. There are, of course, many ways of storing things other than ceramic pottery—making use of objects in the surrounding environment, as with cultures that stored water in empty ostrich eggs. Ceramic technology shouldn’t necessarily be considered an “advanced” or a “more progressive” tool—it is simply a complex one, one that combines these three strategies. Using fired clay to store materials offers a group the ability to store important resources in massive containers—as with granaries, for example. The huge variability in ceramic technology from the Paleolithic to the present serves as a powerful reminder that tools are constantly made and remade in the images of the cultures that use them. 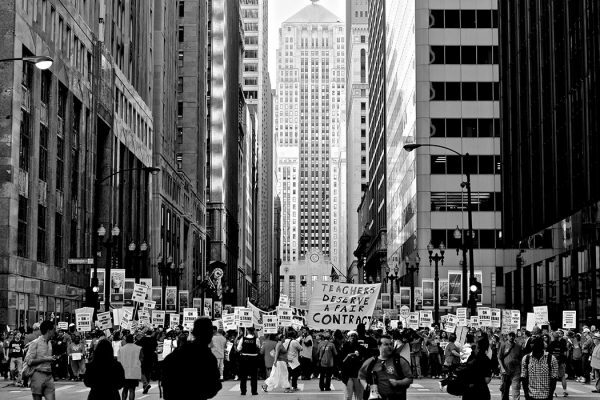 Teachers' unions have been an important force in America since the 1950s.